Hearts owner Ann Budge has addressed the club’s supporters after the Tynecastle side published their annual accounts showing a profit of £1.8m and an £800,000 increase in turnover. The Edinburgh club reported a 24 per cent rise in gate receipts on their balance sheet for the year ending 30 June 2018 and, in a year in which Esmael Goncalves and Jamie Walker left Gorgie, a £400,000 gain from player sales was also included. In her statement provided with the annual accounts, Budge wrote: “From a financial perspective and despite all the challenges we have faced and are continuing to face, we have once again achieved our major objective which was to grow our revenues profitably. “In particular, our turnover increased from £11.3 million to £12.1 million during the year. To support this business growth, our operating costs have inevitably increased. “We received an exceptional £1 million donation towards player costs from our benefactors. She added: “Financial Year 2017/18 saw us continue on our journey to re-establish Hearts as a major force within Scottish football. “Our investments continued, both on and off the field, in line with our long term strategic objectives. Once again, we were faced with a number of different challenges and once again, we met these challenges head on. “By so doing, we managed to deliver a very credible financial performance, while at the same time, making great strides forward in terms of rebuilding our infrastructure. 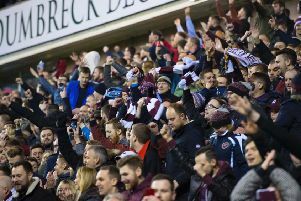 “Off the pitch we reached another key milestone in our Tynecastle Redevelopment Project, when we opened our fantastic new main stand in November 2017. A few weeks later than originally anticipated, it was nonetheless well worth the wait and has set a new standard for football stadia in Scotland. With capacity increased to over 20,000 and hospitality space more than doubled, we have seen increased turnover in both of these areas. “Importantly, our hospitality suites are not only proving popular on match days but also with the business community for quality conference space and indeed with the wider community in terms of function spaces. Our hospitality and catering teams received a number of accolades and awards throughout the year for the quality of the experience they deliver, having risen brilliantly to the challenges this growth has presented. “Construction priorities were changed in the second half of the year, to better meet the short-term needs of our supporters and the club. Having successfully delivered on Phase 1 (i.e. full match-day operations and facilities) we slowed down the major developments in Phase 2 and concentrated on delivering a number of our “sub-projects” such as the new club store, the long-awaited Supporters Bar, the 3rd floor TV studio and the Control Room modification. “These changes in priorities meant a delay to the start of our major 2nd and 3rd floor developments. However, this allowed us to move the focus to laying our new, state-of-the-art £1 million Hybrid Pitch, work on which started immediately after our last home game of the 2017/18 season. “This was the first full pitch redevelopment in nearly 20 years at Tynecastle and included a new undersoil heating system, a new irrigation system, a new computerised monitoring system and much more including the replacement of the supporting infrastructure. (e.g. boiler systems). “Major projects such as the new main stand and the new pitch come at significant cost, but they are key investments to secure the future of the club. While we are beginning to reap rewards from investments made todate, this “Investment Phase” of our journey continues. “The remaining phases of redevelopment are planned and the work will continue during Season 2018/19, with the formal completion and “official opening” being planned for Season 2019/20. “On the pitch and for the second year in succession we found ourselves faced with changing our first team manager. After the departure of Ian Cathro, in consultation with the board, Craig Levein agreed to take on the role of First Team Manager while continuing in his wider role, of Director of Football. “This was only possible because of the significant investment from the club and the efforts of Craig over the last four years, in building a solid management structure to support our football operation. “While our final league position was disappointing, our investment in building a team to take us forward continued. The last two transfer windows have seen us make significant signings, both permanent and loan signings, to strengthen the squad and we are already seeing the positive impact of this investment in Season 2018/19. “As a club we invest heavily in youth. It is a cornerstone of our business model, and there were many highlights during the year, which demonstrated the success of this policy. Our performance school at Balerno, which provides elite youth players with the opportunity to combine both their studies and their footballing education, celebrated its first anniversary. “It has proved to be a great success and is ensuring our young players have enough coaching time to improve as players, without missing out on crucial education and life skills. The focus on our youth structure was shown to be paying large dividends, with nine of our academy players signing professional contracts in season 2017/18 and more young players taking to the field in our first team than in any other club in Europe. “The effect of playing four matches during the season at BT Murrayfield impacted both our revenue and costs, however, whilst we had budgeted to break-even, we actually made a small profit even with the disruption to normal operations. The company’s balance sheet at 30 June 2018 remains strong with net assets of £14.7 million. At year end, approximately £17.7 million of stadium redevelopment costs had been capitalised. “We also continued to benefit from our ongoing partnership with Save the Children and the continuing support of the Foundation of Hearts. “The Foundation have now completed their £3 million contribution to the Tynecastle Redevelopment Project and have commenced repayment of the senior loan to Bidco (1874) Limited. “In summary, it was a demanding year both on and off the pitch but we faced and overcame the challenges by sticking to our values and to our long-term plan. “As a business we are in good shape; growing revenues and managing costs. The future looks bright indeed.